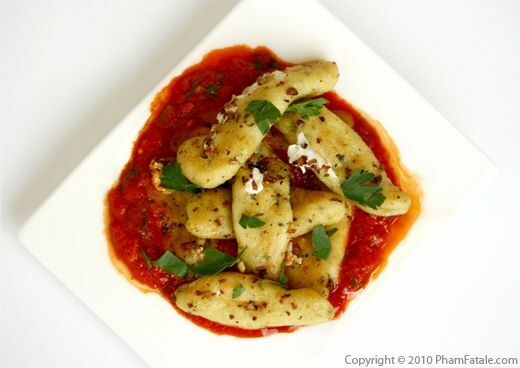 I recently had stuffed gnocchi at a restaurant and have been itching to recreate the dish at home, with my own little twists of course. I decided to stuff my homemade gnocchi with pieces of Nabulsi cheese, which is Persian black sesame cheese. I chose this particular cheese because I like the way it melts when it is cooked. It's not as messy as mozzarella, but it does become soft and a bit stringy. I paired the cheese-stuffed pasta with homemade romesco sauce, which contains pine nuts, almond butter, olive oil, bread, a head of roasted garlic, sherry vinegar and roasted red bell pepper. The bright, red color pops against the gnocchi. And since the sauce pairs so well with seafood, I served fried fish on the side. Lya, Lulu and I had so much fun filming the "how to make gnocchi" video a few weeks ago, and this dish brought back the memories. My little munchkin was sad that she didn't get to help roll and form the gnocchi last time, so I made sure that she got her chance today. She enjoyed it so much, mostly because she nominated herself to be the official taster. Making gnocchi is very interactive, and I’ve found it’s a great way to get kids cooking. It doesn’t hurt that it tastes great too! I made sweet potato gnocchi this weekend. But instead of making regular potato gnocchi with eggs as a binder, I used chana dal paste and a little tahini. The dough comes out a little sticky compared to using eggs, but the texture turns out the same. I paired the gnocchi with Asian ingredients for the sauce and bok choy. I haven't posted anything over the weekend because I spent the last few days filming my very first cooking video! I had no clue how long it would take to film and edit the takes, and I have to admit, it was quite a lot of work. I hope you like it! Let me know what you think and check out the blooper reel below for a few laughs. 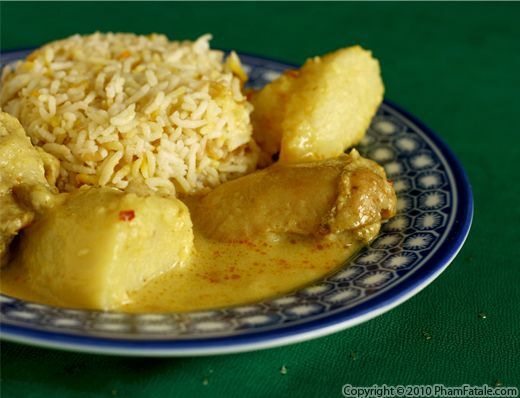 Coconut chicken curry is a dish made in both Vietnamese and Indian cuisines, with minor variations. 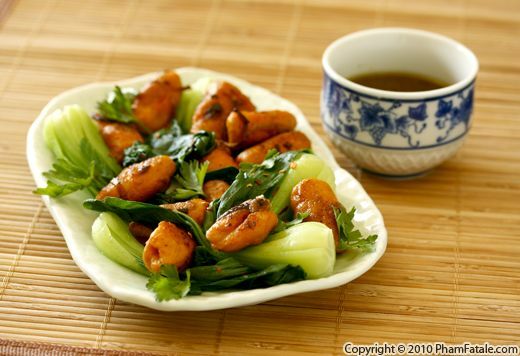 This dish represents the Vietnamese version. The chicken is cooked in coconut milk, spices and a blend of nuts to create a creamy, rich mouth feel. I added galangal, lemongrass, turmeric powder, and kaffir lime leaves. Some people use other spices and add pineapple and various vegetables, but I wanted to keep it simple so the only other addition was potatoes. If you're tempted by this dish but are bothered by the calories you could substitute evaporated milk for the coconut milk. It won't be as creamy, but the flavor will still be there. Aloo gobi is an Indian vegetarian dish made with potatoes (aloo), cauliflower (gobi) and Indian spices. I also added peas, tomatoes and the usual ginger garlic paste. I think aloo gobi was the first Indian dish I ever cooked when I got married. It's very easy to assemble all the ingredients, making it a good introduction to Indian cooking. First, a paste is formed from the spices, and then the vegetables are cooked in the paste until soft. Even though children may not love cauliflower, it is actually a kid-friendly dish. I’ve found it’s a great way to get my little munchkin to eat her vegetables. I just reduce the number of chiles, and serve it with a warm roti (flat Indian bread). Today I made it for us big kids, so I served it with basmati rice. If you’re looking to try your hand at Indian cuisine, this is a great place to start! Cream of tomato soup is a dish we make whenever I'm too lazy to go to the grocery store. It's flavorful, filling and easy to make. 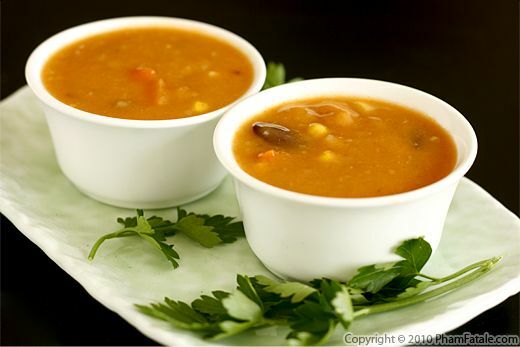 Best of all, the ingredients for the soup are usually available in our garden, pantry and refrigerator. Because tomatoes are not fully grown in our garden yet, I used canned plum tomatoes and added heavy cream to give the soup a velvety texture. I also used a mirepoix of vegetables, which is a combination of coarsely chopped carrots, onions, leeks and celery. We usually eat tomato soup with a baguette, toast or a grilled cheese sandwich. Simple is beautiful!